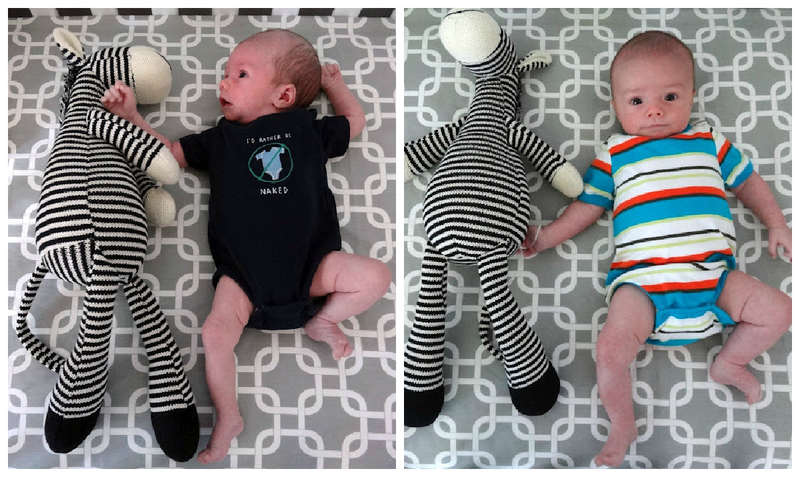 This past Sunday, August 26th, you turned two whole months old! I have to say that the second month has been even better than the first month! Right around 6 weeks you really started to blossom. You smile, with intention, at us ALL the time! You love when I make funny noises with my lips and you absolutely light up when Dad gets home from work. I think you love his big boisterous laugh, and who can blame you? You have even started goo'ing and gah'ing at us...we have little conversations all the time. I think you'll be quite the social butterfly! You had your two month checkup this past Monday, the 27th, and you're doing so well! You are weighing in at 10 lbs and 11 ounces...that's my boy! And you are 23.5 inches long...lean and mean my friend! Then, the moment that I had been dreading since you were born...your first shots! You had to swallow some medicine first which you happily accepted. Then the shot...ooo you did not like it! You started screaming the mean cry that you do only when you're truly upset. Luckily, I was able to hold you and nurse you right after and you calmed right down. I was definitely crying right along with you...I hate to see you upset! I'm also happy to report that your skin has cleared up drastically and you have a ton of new hair growing in. I think you'll take after your dad with your thick hair. Love it! You're such a handsome little guy. You've been very social this past month...you have frequented the beach several times and are quite content being in your carseat, whether it's for a walk or in the car. I'm keeping my fingers crossed that you'll be a perfect little travel buddy in the next several weeks. You have such a sweet demeanor...you really never cry and are always smiling. I don't think we can even comprehend how easy you've made it for us...we feel very blessed! Last, I feel like our bond is becoming stronger than ever. The first month is so nerve-wracking! Am I doing it right? What if I can't soothe him? Why is he crying? Now...we've got a groove going on. You love just staring at me, which of course, I love! And I know I can comfort you now...which is such an amazing feeling. My heart just swells every time you give me a shy smile or when you snuggle in the nook of my neck. I don't think I'll ever grow tired it. I love that you're growing...but please don't grow too fast...mama is still taking it all in! Happy two months Ethan! We love you! He is so so cute! What a fun phase with all the smiles!! Glad you are loving motherhood! He looks so alert now Natasha! Glad things are going well - looking forward to watching E grow! Isn't it amazing how you go from so unsure to duper confident? I think by wk 6 it felt like I had been a mon forever. At her 2 month check up, je must be lean and mean compared to my super chunk! His legs are chunking up, woohoo! We loved the SwaddleMes also but just gave then up at about 14.5 weeks and it went great. They are amazing the first few months! Happy 2 Months Baby Ethan! I love his sweet little grins. My little guy is "long and lean" as well. Isn't it so fun when they start interacting with you and I have to tell you it just keeps getting better! Enjoy that sweet baby! Oh, he is so adorable Natasha! He has the cutest facial expressions!! Happy 2 months, seriously so cute and getting so big! This post brought tears to my eyes! I can't believe Ethan is already 2 months old! He is such a handsome little guy! What a cutie! Great post! Love. Any tips for taking baby pics like you did (month pics)? Sadie is arriving soon, so I'm starting to think about how I can do better this time around! He is just so precious and is looking so much like his mama ;) I hear you on that first month being nerve wracking! I was a hot mess to say the least lol Nothing feels better than when you finally get in the groove so yeah for you guys!!!!! So adorable and getting so big! I know the feeling of time passing by way too fast, but thankfully each week gets easier and way more fun:) Happy 2 months lil E! Glad he's sleeping longer! He's such a little sweetie. I swear he gets cuter by the second! Sounds like a sweet, perfect little guy! What a cutie! Happy birthday to E! He is so precious!! Keep up the good work momma! Where is that super cute stuffed animal from? Loving it! thank you!! It's adorable, and so is Ethan obviously! Aww happy 2 months!!! I totally feel the same way in regards to the bonding. The bond with my little guys is way stronger this month due to the lack of stress that I had compared to the first month. so cute! i love him next to that zebra, great idea! he sure is growing...you can def tell by that last picture!!! crazy i tell you-so glad sleeping habits are going well, too!!! Natasha, he is so precious! You really brought back memories of my boys when they were babies! Glad to hear he is sleeping so well! Enjoy this sweet time! Happy 2 months Ethan! He is so precious! I can't believe E us already 2 months!!! Love the side by side pics, you can really see how he has filled out, and that smile, too sweet!! I hear you on the shots!! Luckily last time Liv didn't cry too hard but usually when she cries I have to stop myself from crying too! It is awful seeing your baby upset/hurt!! Ah he is SOOOOOO precious!!! It is kind of freaking me out how similar he and Parker are! Our happy boys are so good to us! 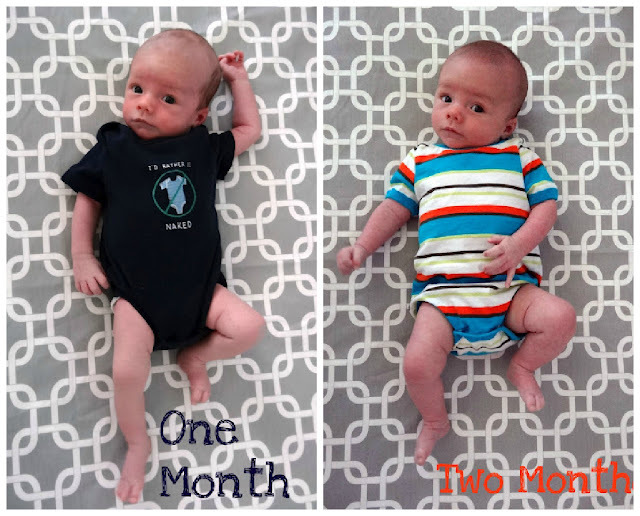 And he has really grown in the last month--love those little leg rolls! He is really adorable Natasha! Cute cute photos. Love those little boots he's wearing! oh my goodness natasha! he is so darn cute! i can't believe he is already smiling! B took her sweet time with that. so happy he is sleeping well and such a mellow baby. it keeps getting better and better, just wait! handsome little man. looks like you are having so much fun. such special moments and memories! love seeing the monthly posts! My goodness, you have a handsome kid! He's getting so big already! So glad to hear this month was great. Just wait, these next couple weeks just keep getting better! I can't believe Mac will be 15 weeks this weekend - every day is amazing! It makes me so excited for you and E!